Edge of the Abyss campaign started on 28th August and I was very happy to join and contribute to this global event. Luckily for me, our fantastic local TO, Tas, already had some great plans and rallied KoW players to participate in weekly game night to fight for the future of Mantica. The friendly crew of Three D6 store hosted us and we had plenty of room to have several games being played simultaneously. 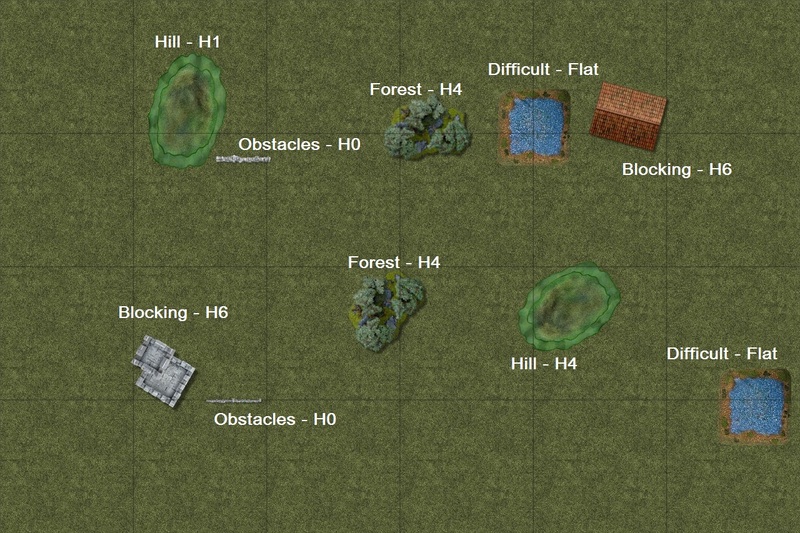 The plan is to play each scenario in each week and then have a big battle at the very end of campaign. Hence, while I am reporting this game with a bit of delay it was actually played on 24/08/2017. As planned, we begun with the very first scenario "On the Precipice" that was fought at The Edges of the Abyss. 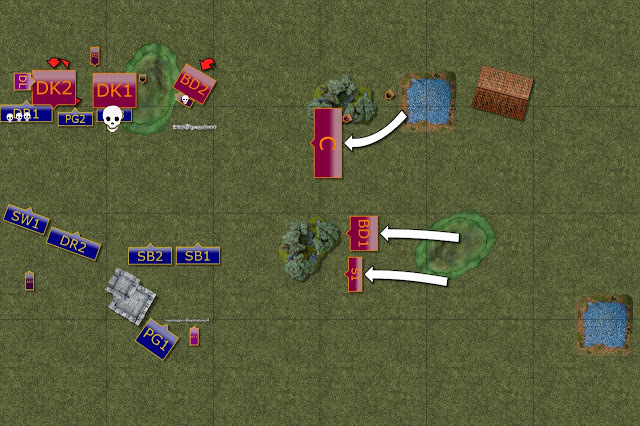 Thanks to the fact that some players have few different armies it was possible to have equal numbers of Good and Evil forces. Twilight Kin is a very interesting army as it is still not finished project for Mantic it seems. 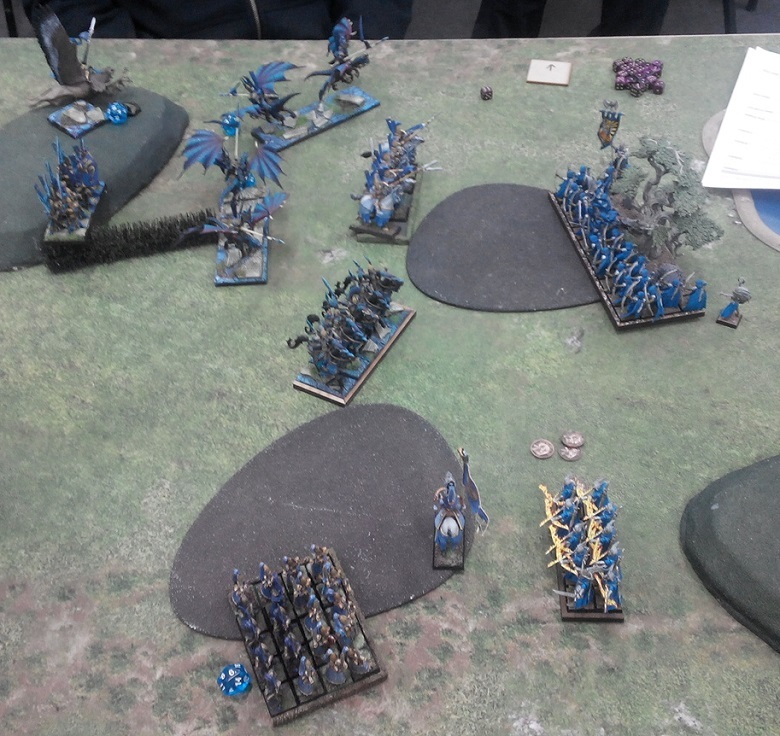 The current army list allows the player to take Elves and Forces of Abyss units but Mark went for Elves only force. Twilight Kin has army wide Vicious rule but what is quite interesting it actually makes it identical to Elite effect. You may be rerolling different dice but the net effect seems to be exactly the same from the mathematical point of view. Fortunately, the army is more than just sum of its elements and the force Matt brought was also different from mine in composition. 40 Crosbowmen - good shooting base, even better with extended range to 36" thanks to the artifact. It will be very difficult to avoid it so I would need to use the terrain to minimize the casualties and accept the fact they will rout some of my units anyway. If I can sneak in some fast unit to disorder it that would be a very good thing to achieve for sure. 2 x 20 Blade Dancers - quite unique units for Twilight Kin. Very fast and that can catch some people off guard. Lots of attacks too but very fragile. I expected them to form a second wave to benefit from cover of other troops. There was a possibility that they would march towards my lines at a double too so that they can reach the enemy as quick as possible. 2 x 10 Dark Knights - more melee orientated units. Dark Knights have 18 attacks which means they hit a bit harder than similar Storm Wind cavalry. Very fast too so I would need to either lure them into a trap or use some fliers to attack them first. 2 x 10 Shadows - Twilight Kin scouts with Pathfinder and Vanguard. I expected them to get into good positions to shoot while not allowing to be shot at in the first turn of the game. However, even in the cover they may suffer due to low defense if I can focus my own shooting at them. Dragon Breath - a bit more shooting and quite flexible too as it can still move and shoot. It will be important not to allow it to get too close to my own units. Especially if other shooters can fire at the same target. Dark Lord on Pegasus - one can consider this hero as identical to Drakon Lord. Fast, flexible, good commander of the army. I am using one and I like him a lot and I know he can cause some trouble. If I can catch it, even with my own lord to get him out of battle line that would be very helpful. 2 x Priestess - unfortunately I cannot remember what exactly did they have in terms of artifacts. I do remember Mark casting Bane Chant though and as they come equipped with Fireballs it means that the shooting potential of the army is big. 2 x Army Standard - last but not least, the Army Standards have very important role to inspire nearby troops. Once again, my apology for not remembering if they had any artifacts. 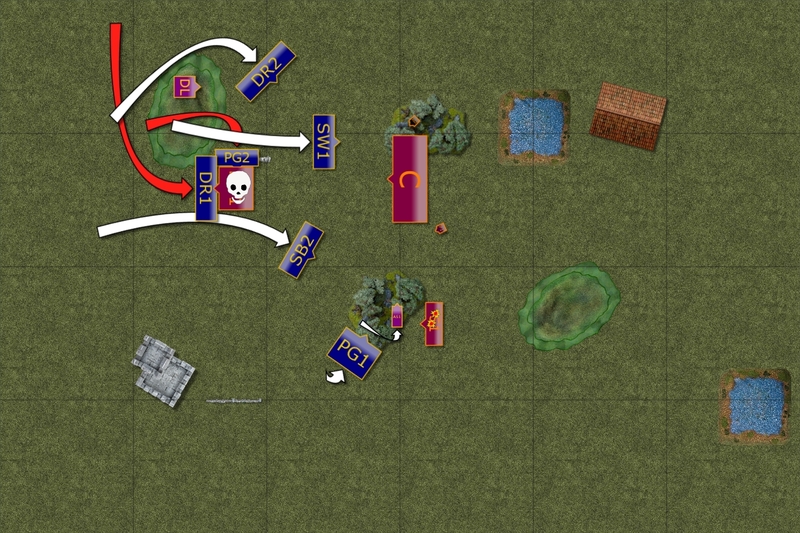 In general, I faced the army which had superior ranged attacks with very good melee orientated units. Infantry was a bit faster, while my own cavalry was either as fast as the enemies or even quicker. I expected that Mark would want to use that shooting to delete one unit per turn at least in order to remove my numbers advantage. 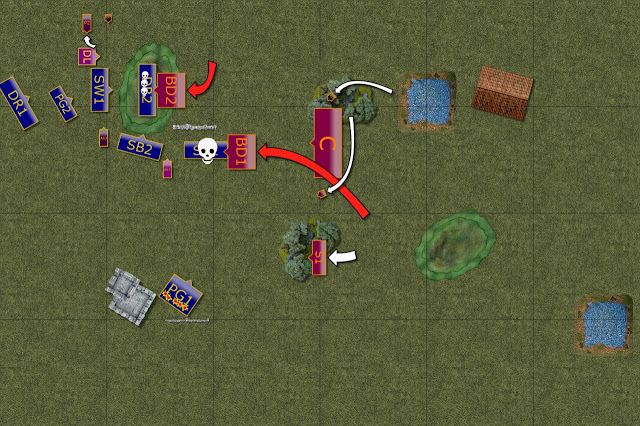 At the same time he could be flexible with his melee orientated units and either hold them to intercept my troops that would otherwise want to distract the shooters or to advance and attack on their own. I decided to see how Mark is going to deploy to choose the counter plan. According to the Scenario rules it was Kill. 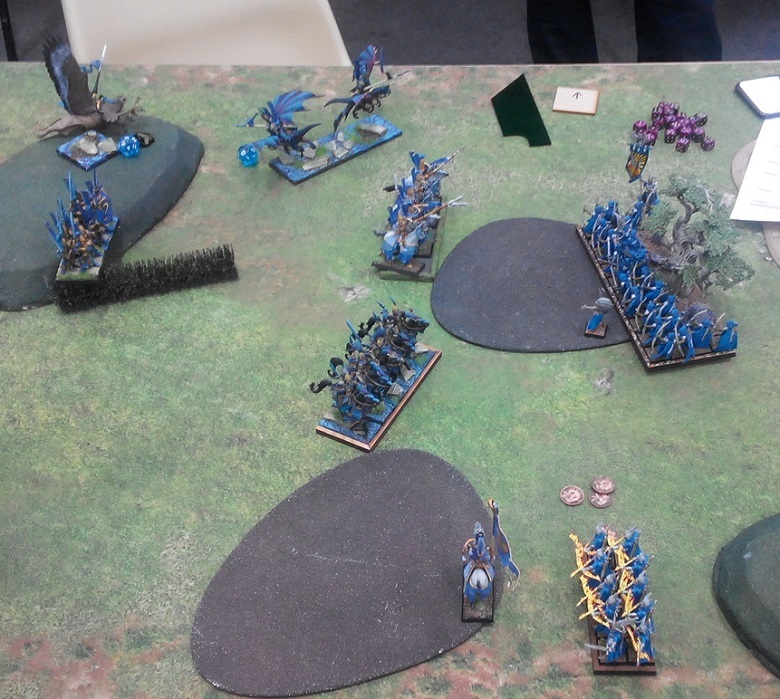 Special Rules did not apply as neither Forces of Abyss nor Salamanders were present in this game. The recommendations were to use lava themed terrain too but we decided that the battle happened just before the eruptions in the areas close but not yet at the Edge of the Abyss. Twilight Kin was there to intercept the Elves as they marched towards the Edge to lend their aid to the coalition of Good forces. According to the rules of the scenario, Twilight Kin had the first turn. 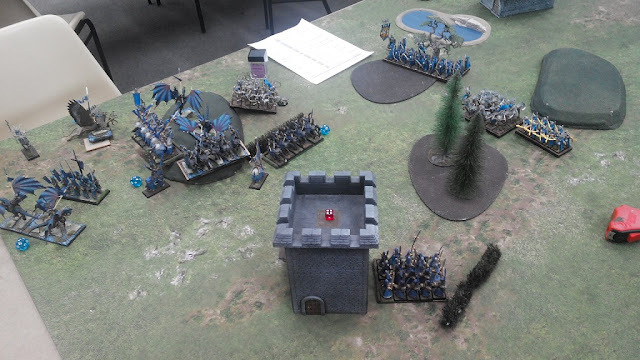 Seeing that Mark decided to spread his forces and use one flank to shoot while the other to attack I chose the plan where I ignored the shooting part of his army for a turn or two in order to overwhelm the Knights. In order to do that I wanted to use triple wave attack meaning I wanted to draw his Knights against my Storm Wind or even be charge him if he gets to close. 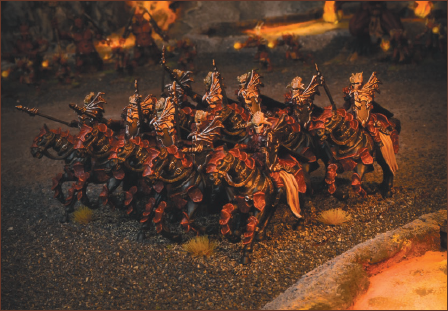 Palace Guard would follow up while Drakon Riders would either aid them from the front or fly over and attack from the rear. If the plan works I expected to trade my heavy cavalry for his and in addition gain space on the left flank to prepare for advancing shooting horde. And starts outflanking from the East. 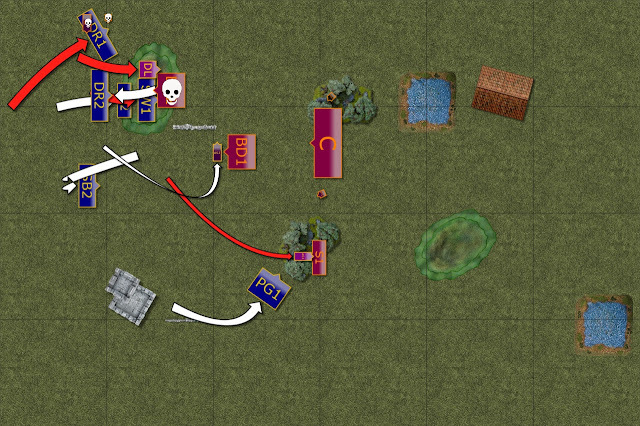 Dark Knights waited patiently as the crossbowmen and their supporting units would move around and outflank the enemy. Fortunately, crossbowmen already had some targets in range and started shooting at the Chariots inflicting some damage. 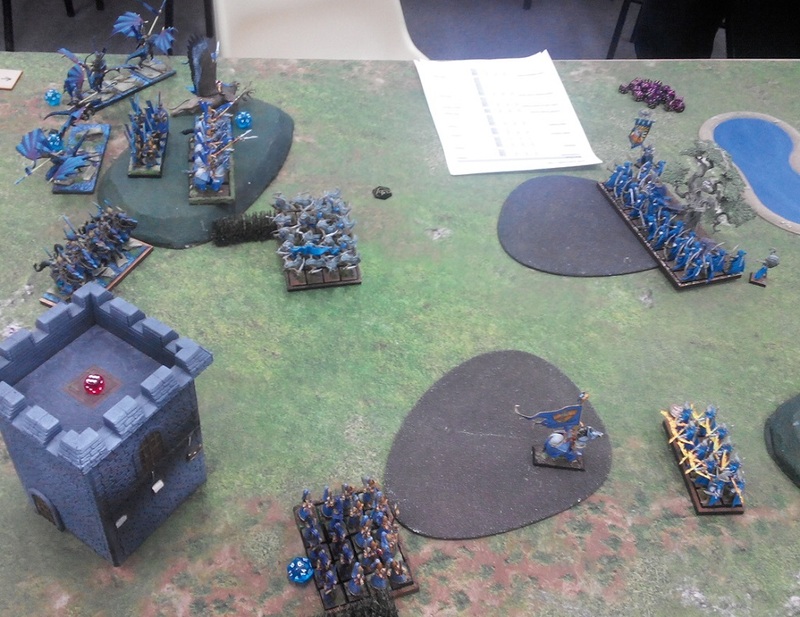 Elves advanced on the left flank but due to quite confined space they had to do it cautiously. Otherwise the enemy would be able to hold them in the narrow bottle neck. 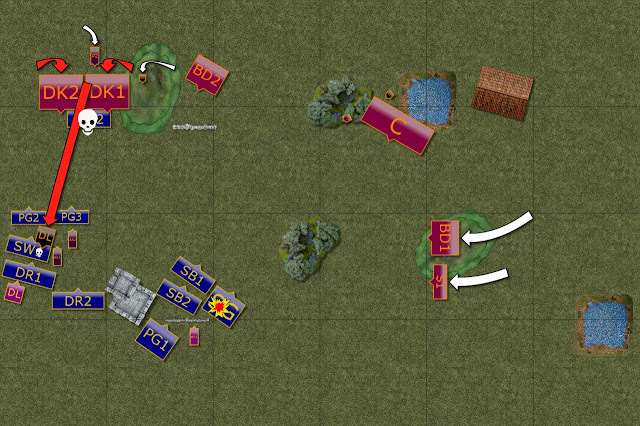 In the meantime, the shooters eliminated enemy Shadows so that was one less unit with ranged attacks to worry about. Chariots could not avoid the incoming fire. Twilight Kin forces continued their outflanking and shooting. This time the Chariots could not shrug off the incoming fire and were routed. The units on the opposite flank held their positions patiently. Elves set up the trap. Further delay would be putting Elves at a danger of being boxed in a corner so this time the units moved more decisively. Using the fact that enemy cavalry was grouped in a tight formation, Storm Wind cavalry galloped across the battle field and distracted both enemy units. 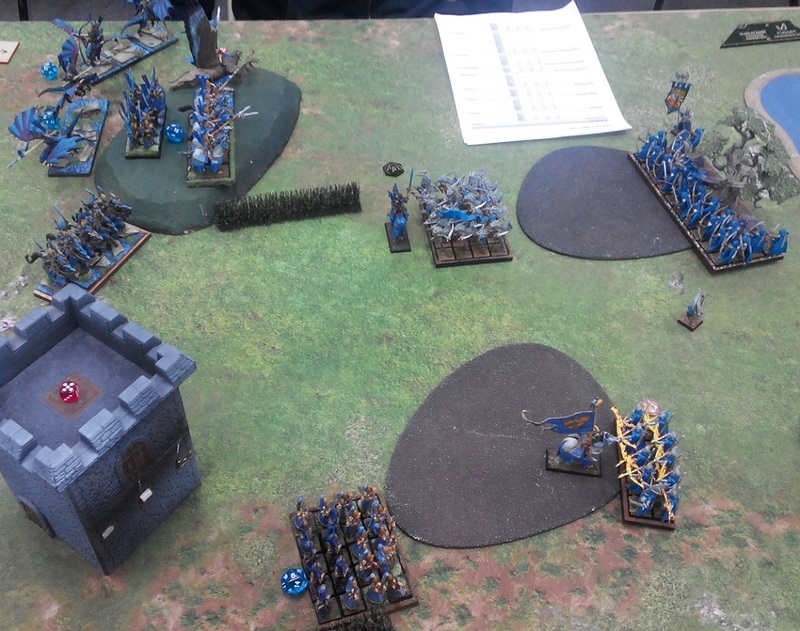 That allowed the rest of the Elven formation for move forward and be in good position to attack. Situation on the Western flank. Twilight Kin routs more Elven units. 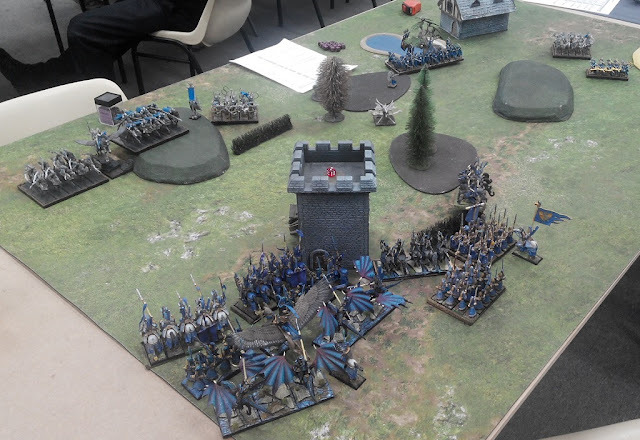 Dark Knights got rid of the annoying Elven heavy cavalry and pulled back a little to try and avoid at least some of the enemy that was about to charge them. 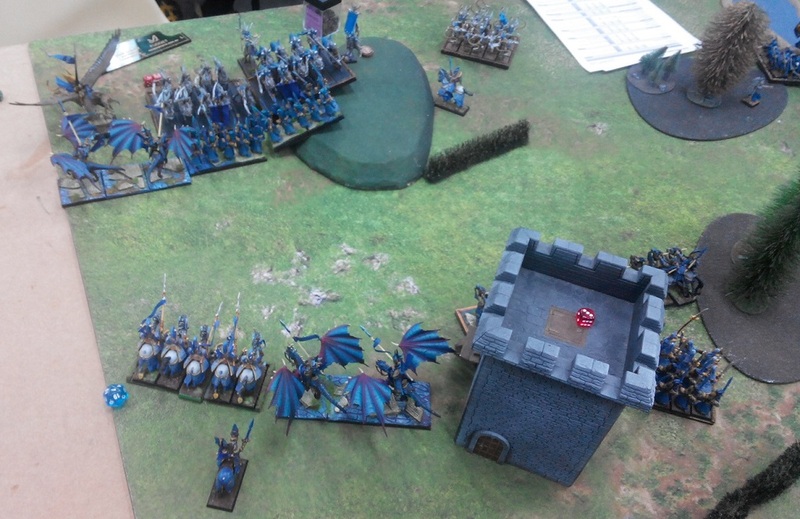 At the same time Dark Lord spotted an opening and attacked a second unit of the Elven Knights, hoping to slow down other units and to disorder the formation. 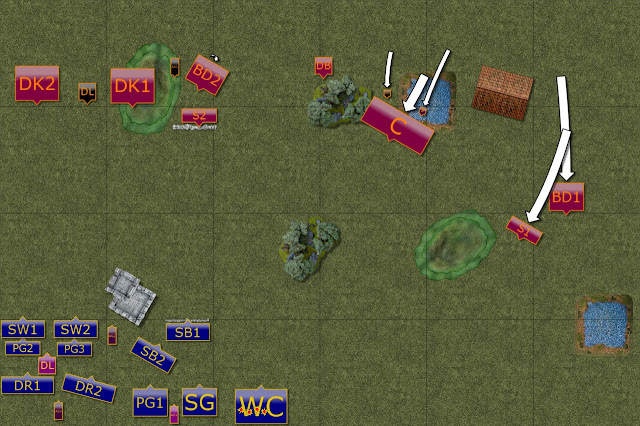 On the opposite flank another round of shooting saw Sea Guard being destroyed. 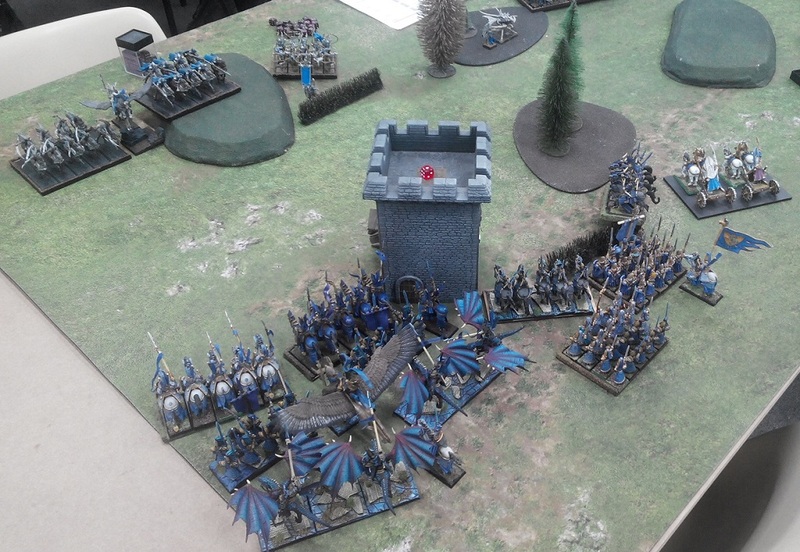 Despite Dark Lord's best efforts, Elven attack was not stopped. He himself had to fight for his life and was soundly defeated. 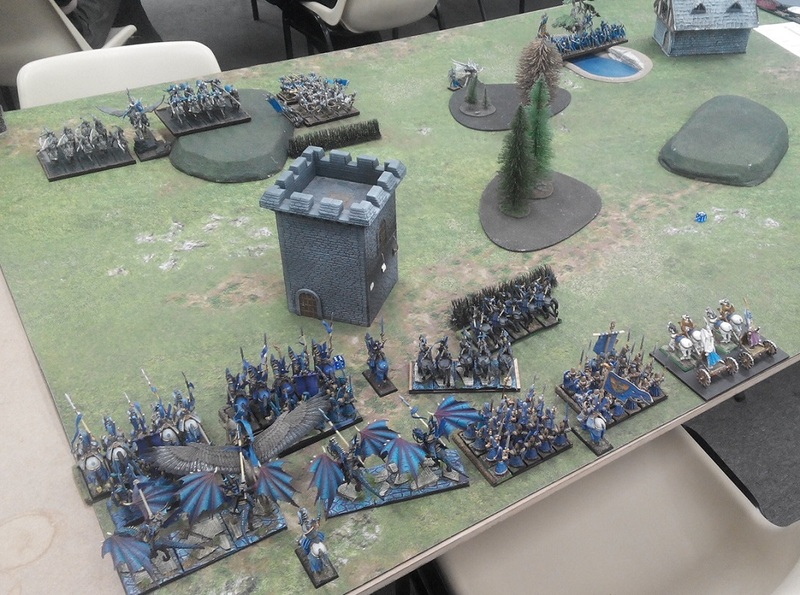 Both Palace Guard units and one regiment of Drakons charged together against Dark Knights who were badly damaged but they held! 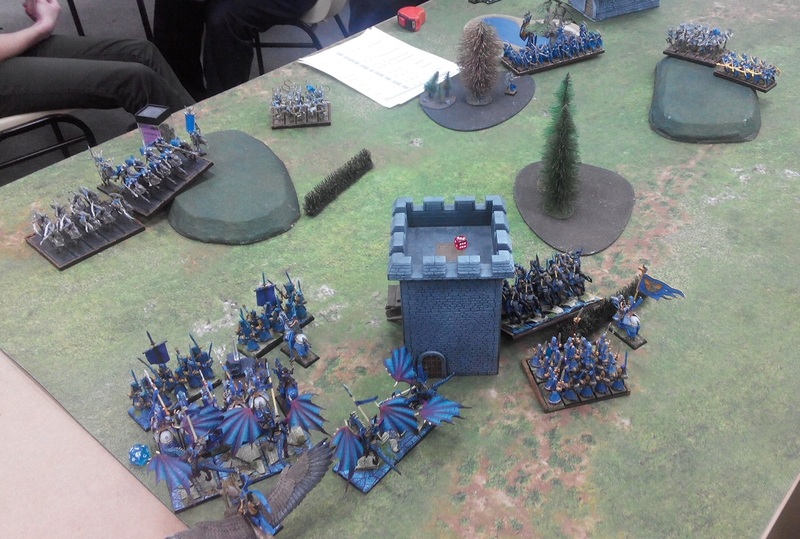 However, that put them in a bad spot, especially that Drakon Lord cound land on the flank and the second wave was getting ready for another punch. 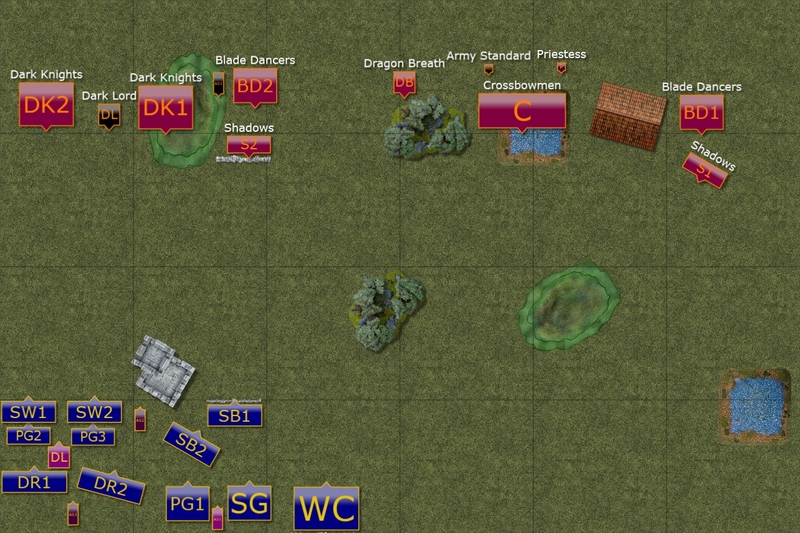 The Dark Knights were now besieged but counter attacked in hope that they may tight the enemy forces long enough for the Blade Dancers and Crossbowmen to destroy them. 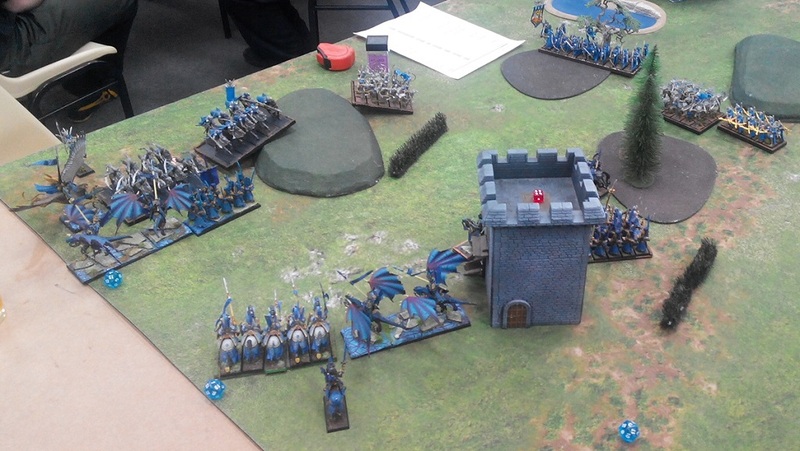 The Knights managed to pin Drakon Riders down and destroy Palace Guard. But would that be enough? 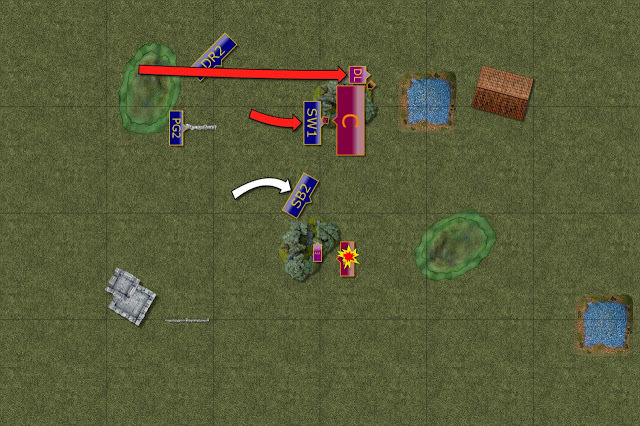 Elven units destroy enemy cavalry. It was a very crucial moment for the battle. 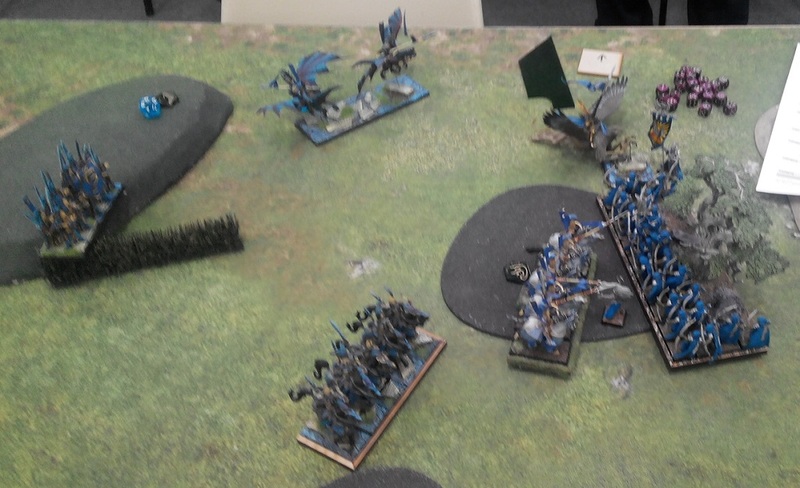 If Twilight Kin cavalry held then Elven units would be in a very bad spot. If Elves managed to destroy the enemy, the reinforcements would have arrived too late. As it happened, good coordination between the units allowed to destroy badly damaged Knights on the flank and rout their companions too. Blade Dancers were shot at and were temporarily wavered. More importantly, they were a bit isolated now. Blade Dancers join the fight. The loss of the Lord and his heavy cavalry was definitely a heavy blow but Twilight Kin was a disciplined army and immediately adapted to new circumstances. Blade Dancers joined the fight and while one unit wavered Drakon Riders (not shown on the diagram), the second outflanked careless Elven fast cavalry and destroyed it. Fortunately for Elves they managed to rearrange the battle line and destroy damaged Blade Dancers. Drakon Riders captured two of the enemy leaders too. Both armies redressed the ranks and got ready for the final push. 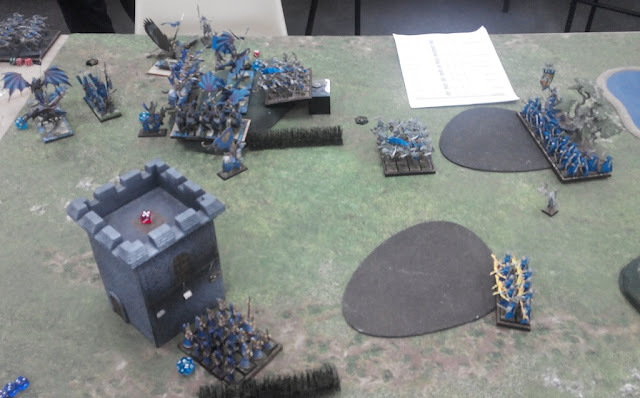 Elves gained some advantage in melee orientated aspects of the fight but Twilight Kin still possessed significant advantage in the ranged attacks. Who would win in the end? Drakon Lord is the target. With so many different target to choose from, the Crossbowmen aimed at the Elven Drakon Lord and wavered him! Blade Dancers got rid of yet another annoying Army Standard but would now need to brace for impact. Twilight Kin would not be impressed! Elves knew that in order to win they have to push to the limits. This time Drakon Riders teamed up with the Palace Guard and routed Blade Dancers. The rest of the units moved towards the enemy. More enemies are shot down. Would that be enough to tip the balance? With only two units left Twilight Kin decided to inflict as much damage as possible. 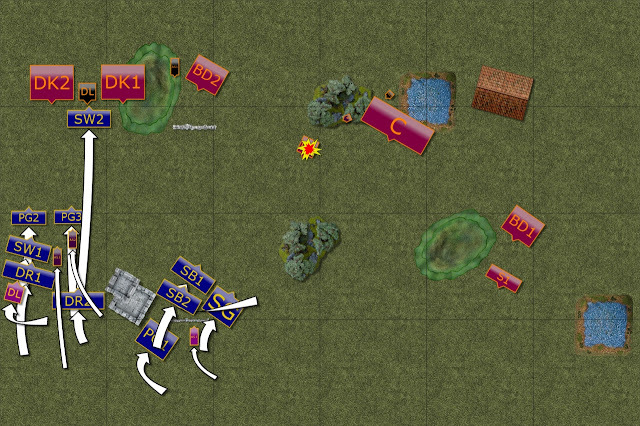 The shooting was aimed at already damaged Elven units and both of them were successfully routed! But would that be enough to tip the balance into Twilight Kin favor? 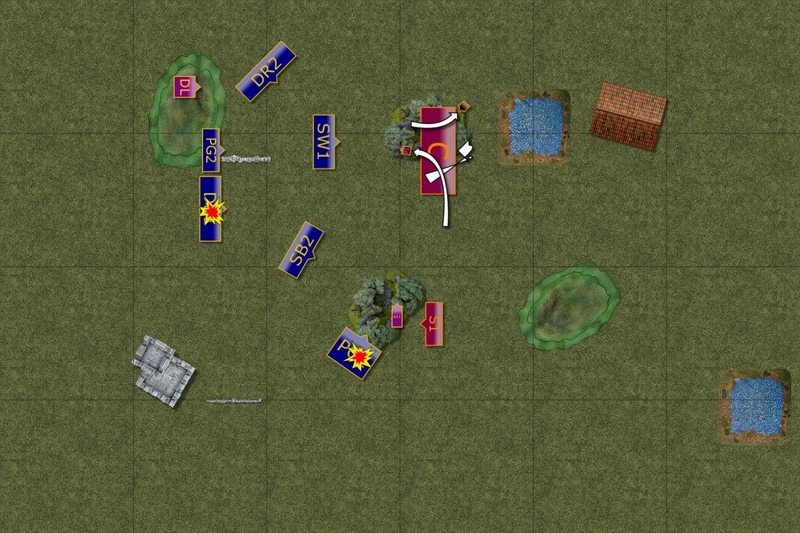 As the remaining units did not have enough power left to mount a successful attack against the fresh enemy in the forest, Elves aimed to attack the remaining elements. 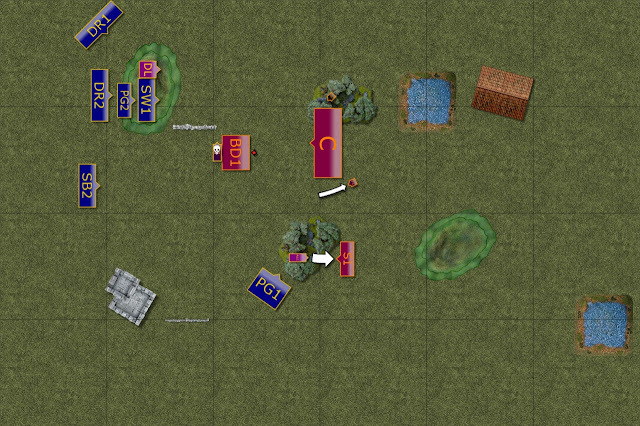 Unfortunately, the Twilight Kin leaders did not yield and only Shadows fell down when shot at by nimble Silver Breeze cavalry. As usual in the civil war this battle was very bloody but this time Elves managed to carry the day. Many thanks to Mark for a game and being a fantastic opponent as usual! It was great to catch up after some time and play against evil incarnation of your army! It was a bloody battle with my army losing around 60% and Marks around 75% of the units points wise. I am happy I managed to win because I was really concerned about the shooting. 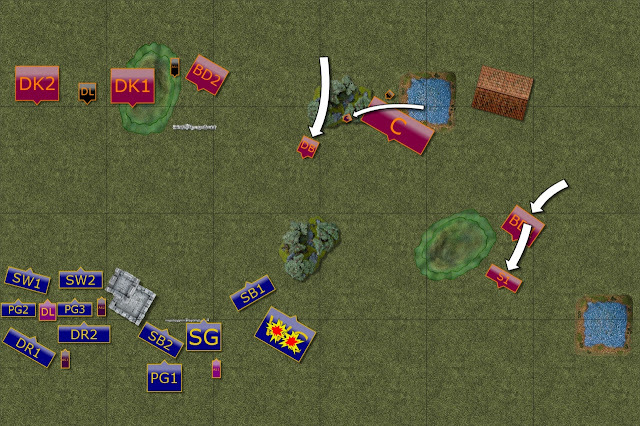 Interestingly, during the game I was focused mainly on the approach on the left flank and only during the report writing I realized how often that plan could collapse. Here are the main issues I have with my own decisions. 1. 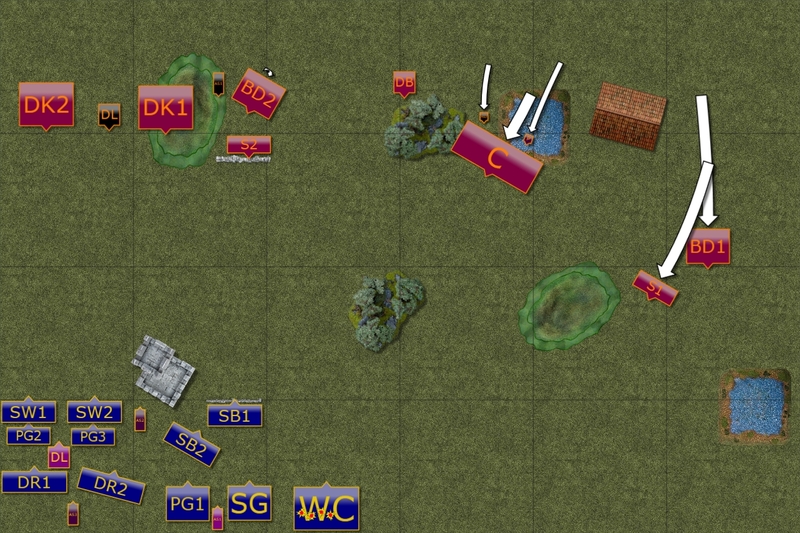 Deploying in a single corner - I think I should have deployed Palace Guard regiment, one Army Standard and one Storm Wind troop on the right flank in order to divert and slow down the enemy there. It was possible that I may even had a chance to rout one of the units there but the exchange would have helped me more. 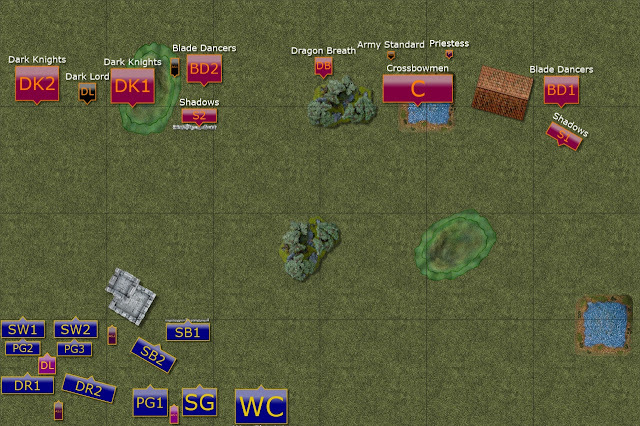 Instead, I lost War Chariots, Palace Guard regiment, Sea Guard and Drakon Riders to the shooting from unperturbed Crossbowmen and Shadows. 2. 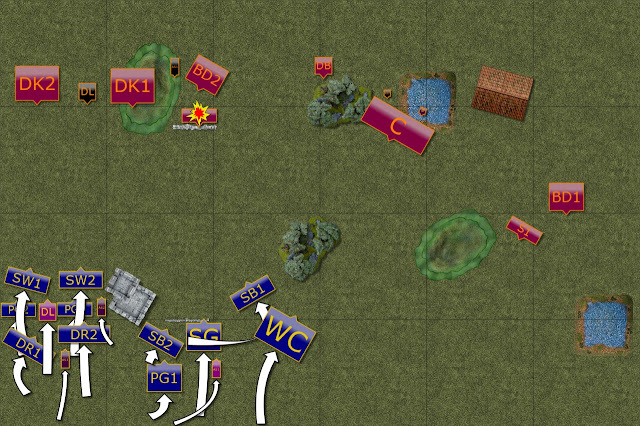 Slow advance on the left flank - it turned out to be still ok but I wasted one turn too many approaching the enemy there. That is why I had a triple line there to be able to exchange the blows. While I was happy to defeat the Dark Lord and his Knights I did not have enough time to organize a proper attack against Crossobowmen. 3. Moving Silver Breeze too close - I missed the part where Blade Dancers could still reach my Silver Breeze. I didn't forget they are faster than any infantry, just didn't check the distance. In the end it didn't cost me the game but it was a mistake nevertheless. 4. Not using Palace Guard - they were really confused as to what I want to do with them. I admit I didn't quite have a plan for them, especially when they were suddenly left alone and were a perfect target for Crossbowmen and Shadows.